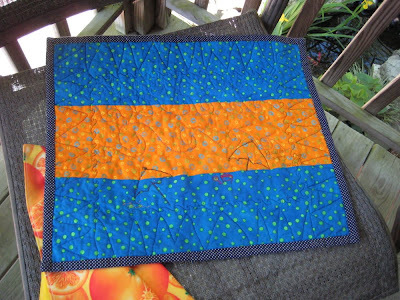 FlossieBlossoms: The placemat swap is over--- I couldn't be happier! The placemat swap is over--- I couldn't be happier! Not that it's over, silly, I couldn't be any happier with the placemat I received from my partner, Isaacsmama, aka Sudi- Laura! Look at what she made for me and I think you'll agree- it's all fabulous and wonderful and very much "me". 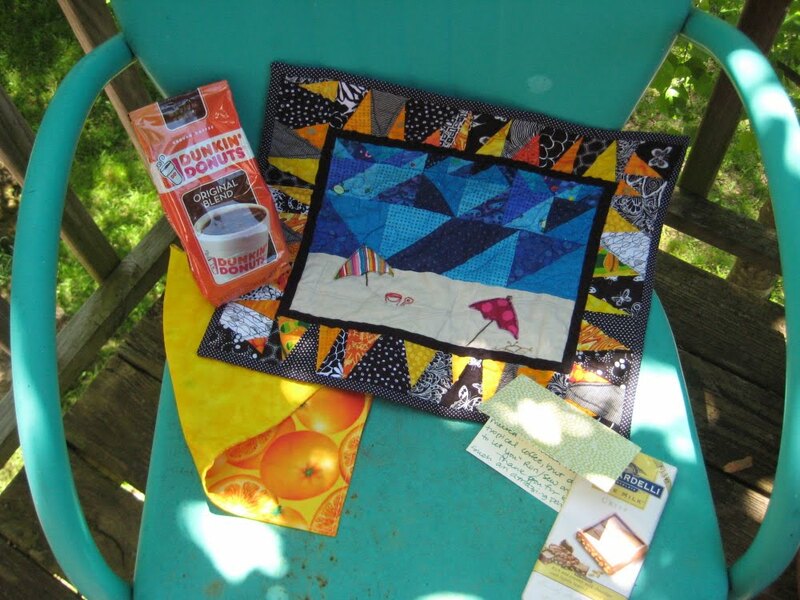 Not only did she make me a wonderful placemat, she also made a matching, lined napkin and sent me some wonderful coffee and a chocolate bar that was so delish, I think it lasted about an hour in this house! Mmmm. Good stuff! The placemat- look at this! So many pieces of fabric went into this little beauty and I like all of 'me! This was a lot of work! 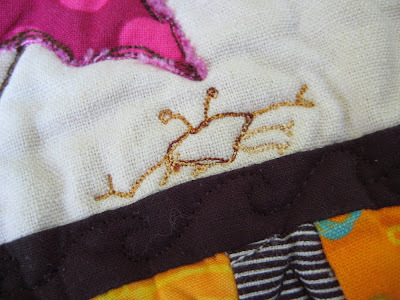 You can really see the quilting more when you look at the pretty back. And the tiny details- I have a crab and a bucket and shovel, I really can't wait to hit the beach in a couple of weeks, I am now primed! Sudi-Laura and I have a mutual love of the beach and so we were PERFECT partners, I think, and we both came away very happy. I would do this swap again in a heartbeat. Thanks, SL! I love my goodies! That's SO you!! I'm glad you got a gorgeous one after all your hard work making your own - she done good by ya! Couldn't be more perfect for you.....it's like all they'd have to do is plop you down in that chair and you'd be all set. So glad you had a successful swap! What a cute placemat. The design is very creative! Great placemat - no wonder you are delighted with it. 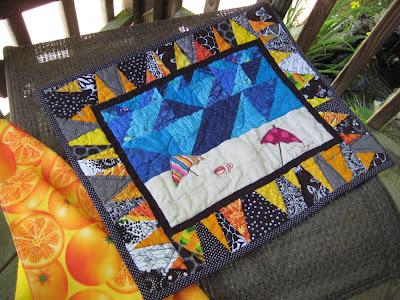 I especially like the outside border. That looks sooo cool ! Lucky lady. Nosey Parker is officially FAMOUS! It's my blogiversary! One year.... woohoo!